Wash and cut the strawberries. 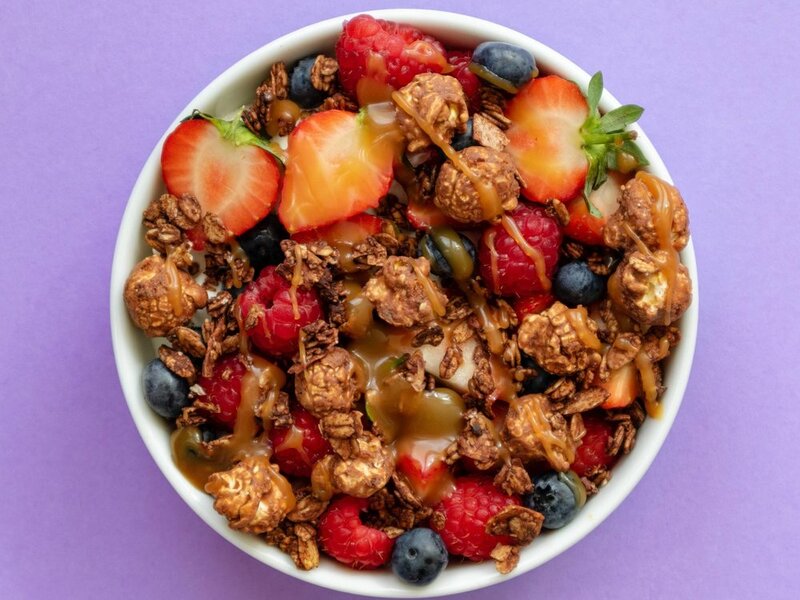 Add Dark Choc Zing granola to your bowl and top it with almond milk. Now scatter the strawberries on top. Break the Ombar chocolate into pieces and add them to your bowl. 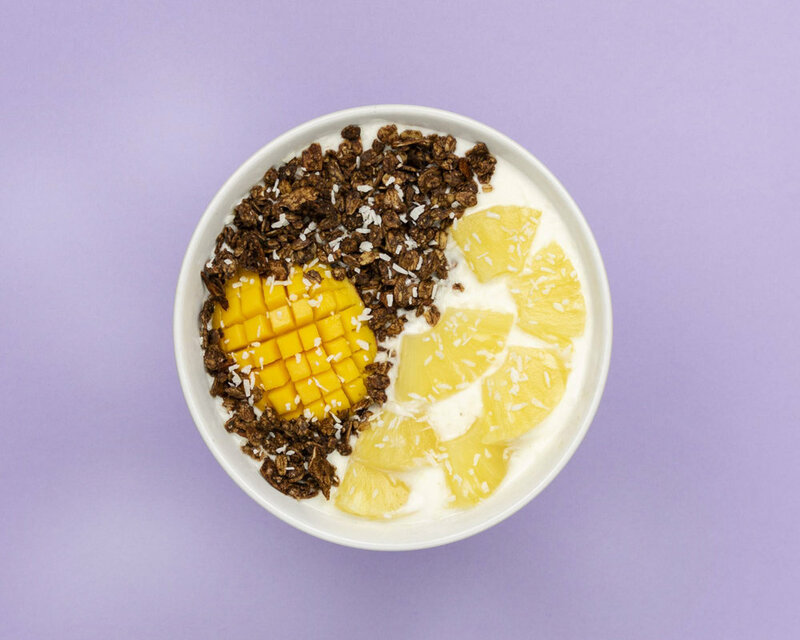 Add natural yoghurt to your breakfast bowl and top half of it with Dark Choc Zing granola. For the mango bit, wash the mango and cut a thick slice of it. Now cut horizontal and vertical lines into it (make sure you don’t cut through the skin!). Once you’ve done this push it inside out until it has a half round shape. Now place it in the Dark Choc Zing granola. Cut the pineapple into slices and then quarter the slices. Place them on the other half and sprinkle some coconut on top of it. Anyone else ready to go to the beach yet? Add a dollop of yoghurt to your bowl. Cut the kiwi into slices and half the slices, place the first line with them. Next to the kiwi add a row of Dark Choc Zing granola. Peel and slice the bananas. Place a row next to the granola and sprinkle some desiccated coconut next to it. Repeat the last step. A bowl that will bring the beach to your breakfast table. Dreamy. Add the protein powder to your shaker and mix with water. Now add Dark Chocolate granola to your bowl and pour the shake over the granola. Cut the bars into stars and cut the remaining bits into little squares. Add them to your bowl. Cut the banana into slices and place in a half circle in top together with the flaked almonds. The perfect pre or post workout bowl! Add yoghurt to your bowl and top Dark Chocolate granola in a circle around the edge. Add a circle of raspberries around the granola, and a single one in the middle. Now sprinkle chocolate spread and peanut butter all over the bowl.